There are several questions that have risen from the recent announcement by the Federal Trade Commission to enforce laws to protect consumers from confusing environmental claims by releasing Green Marketing Guidelines. What will these guidelines mean for reporting standards? Do they carry the possible risk of creating a corporate culture of compliance rather than innovation? What about the imminent need created by these regulations for a complicated plethora of skill sets and technical capabilities, i.e., green jobs and credentials like LEED, HERS, BREEM, and GHG accounting? The Center for Sustainability & Excellence (CSE) will host a roundtable on Green Marketing and Materiality tomorrow to answer these very questions. 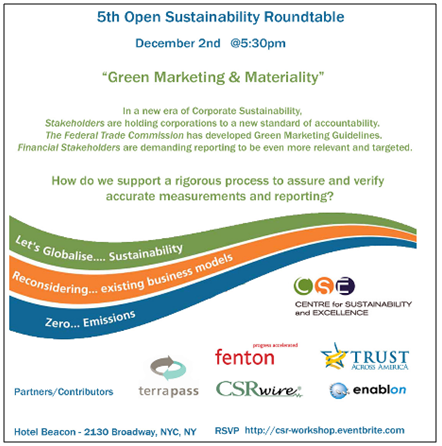 The roundtable, free to attend, will explore the issue of green marketing and reporting with a view to the future. The panelists—which include Susan McPherson (Fenton Communications), Nikos Avlonas (CSE), Joe Aamidor (Enablon Solutions), Joe Sibilia (CSRwire), Charlie Green (Trust Across America) and yours truly—will have a multitude of issues to debate all leading to one big question: How can we support a process to assure and verify accurate measurements and reporting in this new era of corporate sustainability and accountability. So, whether you feel strongly about sustainability, green marketing and reporting standards or simply want to learn what others have to say, stop by. Got perspective or a prediction on how this could pan out? Then join the debate and connect with me @VaultCSR or write to In Good Company.